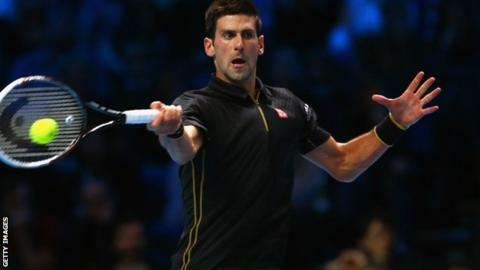 Novak Djokovic admitted his season had come to an "awkward end" after Roger Federer withdrew from Sunday's ATP World Tour final in London. Federer, 33, pulled out with a back problem after a lengthy semi-final against Stan Wawrinka on Saturday. That left world number one Djokovic to collect the trophy before playing an exhibition set against Andy Murray. "You cannot blame Roger. I'm sure he would play the World Tour finals if he could," said Djokovic, 27. "This is probably the first time in history that this happens. It's a very awkward situation to talk about, to be honest. "You never like to win, especially these big matches against big rivals, with the retirement, but that's the way it is." Djokovic only learned that Federer was withdrawing during the preceding doubles final, and the Serb paid tribute to Murray for stepping in as cover. ATP executive chairman Chris Kermode said he called Murray at 14:00 GMT, and the Scot "instantly" agreed to travel to the O2 to play a set of singles, followed by doubles with John McEnroe, Tim Henman and Pat Cash. The British number one, who suffered a crushing 6-0 6-1 defeat by Federer on Thursday, was back on the centre court in front of 17,000 spectators by 18:00 GMT. "I want to thank him for coming out and making an effort," said Djokovic. "It really is an effort. I know how it feels when you finish the season, as he did on Thursday. "Probably the last thing he's thinking about is tennis now. He wants to rest after a long season. It's very genuine from him." Djokovic ends the year as world number one for the third time in four years and won his seventh Grand Slam title at Wimbledon. But he lost to Rafael Nadal at the French Open once again. "Right now I'm at the pinnacle in my career," he said. "I physically feel very fit. I'm very motivated to keep on playing at a very high level. "So as long as it's like that, I'm going to try to use these years in front of me to fight for number one in the world and to fight for the biggest titles in the sport. "Roland Garros is, was and still will be one of the biggest goals that I have." Djokovic's immediate priority is returning to wife Jelena and their son Stefan, who was born last month. "I'm very hands on," he said. "My wife told me what to expect. I've seen it before I came to Paris and London. "I'm glad during the stay in London for these 10 days I got a lot of sleep, because that will not be the case from now."